Published on February 25, 2019 by Rachelle J. Total books for the year: 11 of 50. This past week was rough. I read a lot more than I thought I would have time for, and I’m pretty sure that was me doing the right thing and practicing self-care by making time for reading. I also really love the books I’m reading right now, which always makes a difference in how many pages I turn. Published on February 24, 2019 by Rachelle J. My TBR pile shot up to 686 books, mostly because I finally got around to adding the books I’ve bought in the past few months, and partly because I added some books to my wish list. Rest Haven by Erik Therme – KEEP. This book sounds like the perfect kind of Horror for me to read during the Dewey’s 24-Hour Readathon in October. The Reader by Traci Chee – KEEP. I found out about this book during a panel at the Texas Book Festival several years ago. The story is set in a world where no one reads or even knows what books are, and that is terrifying to me. I must read it! Burn Baby Burn by Meg Medina – KEEP. I found out about this one during the very same panel. It’s YA Historical Fiction about a time I know very little about, 1977 in New York when a serial killer known as Son of Sam was out killing people on the streets. Curse of the Boggin by D.J. MacHale – KEEP. I found out about this book at a different panel that day at that Texas Book Festival. It’s written by the creator of the show “Are You Afraid of the Dark?” This book also involves a mysterious library. I’m hoping to finally pick this one up during the 24-Hour Readathon. The Forever King by Molly Cochran – KEEP. I bought this book when I realized that I already had the 2nd book in the series, The Broken Sword. I started it quite awhile back, but got sidetracked by another book and never picked it back up. I think reading it sometime this Spring is a good idea. My TBR mountain is still at 686 books. I’m only a couple of posts away from getting into the books I added in 2017 and the halfway point of the mountain, assuming I don’t add any more books. I wonder if that’s even possible?! Published on February 18, 2019 by Rachelle J. Total books for the year: 10 of 50. How is The Court of Thorns and Roses considered to be YA?! I’ve been sick most of the week, and am finally beginning to feel human again. Luckily, I don’t have work today so I can continue to rest whenever I’m not washing everything my germy self has come in contact with while I’ve been stuck at home. I’ve been very sick this past week, which means I’ve had time on my hands to read whenever I’m not sleeping. My TBR pile is down one to 674 books. The 131/2 Lives of Captain Bluebear by Walter Moers – KEEP. This is the first book in the “Zamonien” series, of which I have read books 4 and 6, The Labyrinth of Dreaming Books and The City of Dreaming Books. The series doesn’t have to be read in order, similar to Terry Pratchett’s “Disc World” series, but some of the books (including the 2nd) haven’t been translated into English from the original German yet. Deadlight Jack by Mark Onspaugh – KEEP. I got this book through Netgalley quite a long time ago and still haven’t gotten around to reading and reviewing it. It’s supposed to be a Fantasy Horror Thriller, similar to the kind of fantastic stories written by Joe Hill. We’ll see. The Boy in the Cemetery by Sebastian Gregory – KEEP. I’m not gonna lie, it was the cover and the title that grabbed my attention. They remind me of something Neil Gaiman would write, such as The Graveyard Book. The synopsis didn’t end that feeling so I’ll keep this one and keep my fingers crossed that it lives up to my expectations. The Screaming Staircase by Jonathan Stroud – KEEP. Like The Boy in the Cemetery, this book’s title and cover were what made me pick it up, and the synopsis sealed the deal on me keeping it. Also, the “Readers Also Enjoyed” section on this book’s Goodreads page is full of books I loved reading, including Greenglass House by Kate Milford. Here, There Be Dragons by James A. Owen – KEEP. An atlas of all of the lands in myth and legend? A ship that can take you to any of them?! Yes, please!! My to-read shelf is holding steady at 674 books. Sometimes the slightly younger version of me knew what she was doing when she added books to her TBR. This week’s batch of books is proof of that. Published on February 11, 2019 by Rachelle J. Total books for the year: 8 of 50. I really thought I was going to finish Dragons of Winter Night by the end of the weekend, but I got distracted by The Book of Awesome. I might finish both by the end of this week if I’m lucky. Published on February 9, 2019 February 8, 2019 by Rachelle J. My TBR pile is holding steady at 676 books despite my late-night under the blanket reading by book-light after the Boyfriend went to sleep. Quest by various authors – KEEP. 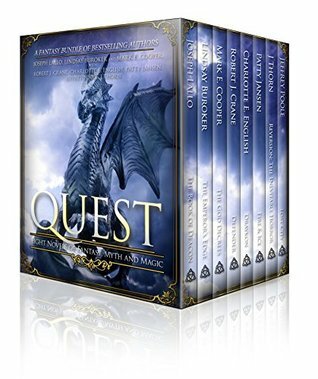 This is an 8 book Fantasy bundle that I’m sure has at least one book I will enjoy reading. Harbinger of Doom by Glenn G. Thater – GO. 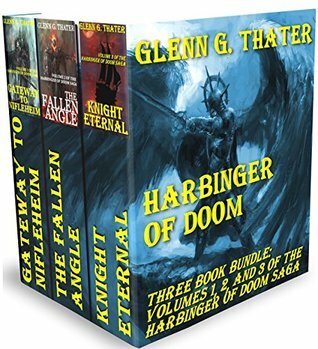 This bundle is the first 3 books in a 9 book series with a description of the Main Character being “an enigmatic warrior of unknown origins and mystical power. No mortal man is his match in battle. No sorcery can contain or confound him. No scholar or sage can outwit him.” No. Not even Kvothe has that sort of unlimited talent or skill for all things. Mischief, Mayhem, The Blue Men of Minch by Monte French – KEEP. This story takes place in Scotland and involves all sorts of interesting mythical creatures. There’s no way I’m not giving this book a chance. From the Dust Returned by Ray Bradbury – KEEP. A Vampire story by Ray Bradbury? Yes, please and thank you! The Barefoot Queen by Ildefonso Falcones – KEEP. One of the Boyfriend’s Aunts, who is a retired Librarian, was reading this awhile back and it looked interesting. She has never steered me wrong in book recommendations, so I will definitely be giving this book a try. It’s a little surprising to me that I only ditched one book this week. When I was looking at my TBR last week, I thought for sure I would be throwing more off of my book mountain. Maybe I’m being more forgiving of the pile since I have been doing another round of KonMari with all of my other belongings (No, I haven’t watched the show on Netflix yet). Hopefully I will have at least one less book on my TBR by next week, but 675 books is pretty good for this early in the year. Published on February 4, 2019 by Rachelle J. Total books for the year: 7 of 50. This week was busy, and while I’m still 3 books ahead of schedule for meeting my annual reading goal, I didn’t get much reading in.